Fender owned the guitar market in the early 60s. The Californian surf scene was exploding, and the well-heeled middle-class kids wanted sleek Fender models, sprayed in the same Lake Placid Blue, Shell Pink and Dakota Red DuPont paint as the Cadillac, DeSoto and Oldsmobile motors rolling out of Detroit. Noting that his competitors - Gibson, in particular - were struggling to meet the demands of this emerging young demographic, Leo Fender determined to strike the death blow with the launch of his highest spec'd guitar yet, 1962's Jaguar. Compared with Leo's brilliantly simple Tele, Strat and the groundbreaking (and shaking) Precision Bass, the Jaguar was ridiculously over-engineered. The combination of the short-scale 610mm (24-inch) bolt-on maple neck and the fussy floating vibrato, borrowed from the existing Jazzmaster model, caused tuning problems. The six-saddle bridge was prone to rattles and buzzes; the height adjustment screws on the bridge saddles would shake loose when the strings were hit with any reasonable force; and the control layout was complicated. The Jag-embracing surf scene succumbed to the onslaught of Beatlemania in 1963, but the model remained in the Fender catalogue until 1975 when it was finally dropped. A decade later, it was rediscovered by a legion of indie, grunge and shoegazing players such as Kurt Cobain, and Kevin Shields of My Bloody Valentine. Its overtly treble-weighted sound and old-school looks and hardware were the perfect antidote to the lollipop stick-necked metal machines brandished during the era.It wasn't Leo Fender's finest hour from a design point of view, but the Jaguar has always been much more than the sum of its design quirks. For a start, no other guitar cuts through a mix with such spine-tingling efficiency. Its single-coil pickups make a fuzz pedal spit and splutter in a way that a humbucker-loaded plank could never hope to emulate. 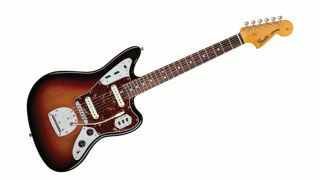 And, let's be honest, the Jag is undeniably cool: the recent Kurt Cobain and Johnny Marr signature models are proof of that. In the latter case, Johnny insisted on tweaks to make the Jag more user-friendly. Of course, he didn't mess with its good looks - that's the bit Leo got right.